The other night on my way home I noticed a lot of activity going on over on Kent Ave. 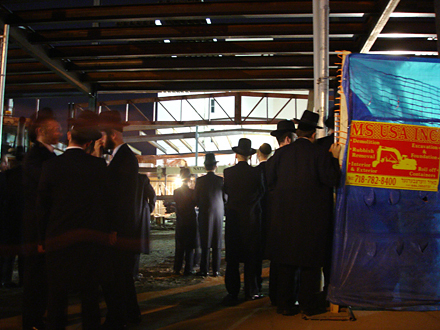 Turns out the Satmar's are building a new Synagogue in time for the New Year, or should i say in record time! They started a week ago and I was told they will be done by the New Year, which is in less then a week. 2 weeks to build the whole thing! Aye... where are the building inspectors!!! !